Meet Anish Mukherjee and Debarghya Sarkar whose bottle cap project has earned them the honour of having two minor planets named after them. They talk about coping with studies and what drives them to excel. Anish Mukherjee (18) and Debarghya Sarkar (19) have just graduated from South Point High School in Kolkata and already have one minor planet each being named after them. Minor planet 2000 AH52 (Citation No 25629) is now known as Mukherjee and minor planet 2000 AT53 (Citation No 25630) is named after Sarkar. This reward is a result of an unsuspecting bottle cap design, which the two are now in the process of patenting. For the last eight months Mukherjee and Sarkar have been working on an innovative design that would make bottle-caps completely tamper proof. 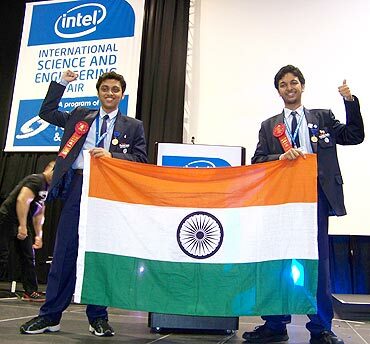 They presented their design at the Intel International Science and Engineering Fair at Reno in Nevada last year and won the second grand prize — the honour of having a minor planet each being named after them. Discovered by MIT Lincoln Laboratory, these heavenly bodies were officially named sometime in March and Mukherjee and Sarkar were informed about it late last month. The two who have been classmates for the last couple of years at South Point High School are now studying in Jadavpur University. Anish Mukherjee and Debarghya Sarkar tell us how they balanced their project and schoolwork and managed to etch their names in space. Q What is the project all about? Anish: Clamped Bottle Cap: A Novel Tamper-proof Bottle Cap Design is an innovative design that will make it impossible to tamper with bottle caps. Debarghya and I would notice a lot of people not discarding their mineral water bottles properly. We thought of coming up with this idea so as to minimise the tampering. Debarghya: The design can also be used for bottles carrying IV fluids and other medical liquids. These will be single-use caps while those used for mineral water bottles will be multiple-use ones so the bottle can be used later for personal use but it will show that the seal has been broken once. You wont be able to cheat and repackage that bottle to be sold again. 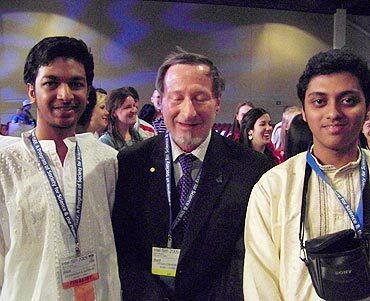 Q How did you get to the International Science and Engineering Fair? Anish: We had submitted five projects of which this one got short-listed and was an entry for IRIS (Initiative for Research and Innovation in Science) Science fair. The IRIS fair is the largest science and engineering fair for innovative research based projects at the school and junior college level in India. The scientific review committee selected our project and we won the first place at the fair. After that we were assigned a mentor and had to attend special coaching sessions in Mumbai where we worked on bettering the design. With this design we participated in the International Science and Engineering Fair at Nevada, where we won the second grand prize and have a minor planet each named after us. Q What is a minor planet and who decides what to name it? Anish: A minor planet is smaller than a planet but larger than a comet. It directly orbits the sun. There are over two lakh minor planets been discovered so far. MIT Lincoln Labs discovered the two minor planets that have been named after us were. So they get the right to name them. Since Lincoln Labs was associated with International Science and Engineering Fair, they had offered this as a prize. Q Did you expect to win? Anish: Honestly, when we started off neither of us thought we’d get this far. But when we won at the national level, our morale got a boost and we were positive of doing well at the international fair. Q Are you planning to market your product? Debarghya: Not yet. We have applied for a patent for the design and are still waiting for it to come through. We haven’t as yet thought about how to go about marketing it. Q Could you tell us something about yourself? Anish: I completed my higher secondary this year from South Point High School and am studying electrical engineering Jadavpur University. My father is a government servant and works with Food Corporation of India. My mother’s a homemaker. I live in a joint family with my grandparents and uncle and aunt and a cousin who works as a tax analyst at PricewaterhouseCoopers. Debarghya: Anish and I have been classmates. I’m also studying electrical engineering at Jadavpur University. My mother is a homemaker and my father is in the medical goods business. Q How and where did the two of you meet? Anish: We knew each other as we studied in the same school. Debarghya is into dramatics and I am in the school choir. So we used to bump into each other often. For the last two years we were in the same class and that’s how we got to know each other better and we struck a rapport because we have similar interests. Q What do you do when you aren’t studying? Anish: I like reading all kinds of books and listening to music. I’ve learnt the keyboard and I like playing it once in a while. I enjoy playing computer games and though I am not an outdoor person I do like a game of cricket every day. Debarghya: Quite like Anish, I too spend most of my time reading books and listening to music. Besides that I am into dramatics. Q How did your parents take the idea of you doing this project? Debarghya: Both our parents supported us and helped us financially. My dad being in the medical goods business referred to some of his good contacts and could check out some pharmacy designs, understand where and how we could innovate. Q I’m sure you must have had differences while working together. How did you resolve them without killing each other? Anish: Of course! There were times when we wouldn’t agree on designs or workability of the design. We would discuss and agree upon incorporate aspects of both our suggestions into the design. Q What were the challenges you faced while working on this project? Anish: Taking time out for this from the school schedule. But again this was something we were enjoying so it wasn’t as stressful as you might imagine. Also we got a lot of support from our school. They let us take off whenever we had to travel to Mumbai for the training or otherwise. That takes a lot of pressure off. Debarghya: Balancing studies with the project. Sometimes it got a little difficult but I guess we managed to strike a good balance after all. Q How many hours do you study in a day? Anish: I don’t think there is a fixed number really. I study whenever I feel like it. But I think I can say for about four hours or so a day. Debarghya: Same here! I don’t really count how many hours I study. Q What would you advise young people who commit suicide because they cannot deal with the pressures? Anish: In life there will be a lot of pressures. Pressure of studies should be the last thing to push you to take the drastic step. The idea is to be courageous and deal with the hardships without giving up. Debarghya: Teachers don’t set syllabus that is out of students’ scope. If you practice enough you really can achieve what you want. I’ve never really failed but I did score far below my expectations once in Maths. I simply sat down and worked harder on it. The next exam I scored a hundred. Q Can you offer five tips to young students on how to cope with studies and stress? * Don’t study too much — it will tire you out. Engage in extra curricular activities. * Rote learning will not take you anywhere — understand what you are studying. * Read books, which aren’t related to your syllabus. Develop a habit of reading people’s biographies and learn from their lives. * Discuss your studies with your friends. If you get bored studying alone, study in a group. It always helps. * Study regularly; don’t leave anything for the last moment. That will take most of the pressure off you. * Have a questioning mind. Ask people, ask yourself and increase your knowledge. * Practice whatever you’ve learnt. There is no other alternative to practicing. * Put a thought into what you study. Ask yourself why certain laws came into being and what they mean. * Cultivate an interest in your subject. Q Finally, what are you planning to do in life? Anish: I’m planning to pursue a doctorate in pure sciences and applied physics and continue in research. Debarghya: I find the idea of engaging in research very attractive. Somehow I don’t think I will fit into the corporate world. So I guess I will continue in academics and pursue my research after a doctoral degree. One Response to "These boys have planets named after them"
This is a well published website, and in addition I have already bookmarked this excellent web page for long term research. I am going to definitely be a returning reader.